The handheld computers we carry in our pockets represent almost unimaginable complexity. Batteries, sensors, chips, circuits, and touch displays in a space age shell, all painstakingly assembled by thousands of workers and shipped globally. Smartphones have disrupted numerous industries. Up next? Disrupting how such modern marvels are made. What if you could dramatically reduce the number of parts and eliminate assembly—what if you could 3D print a smartphone? Voxel8’s new 3D printer, which can print functioning electronic devices all in one piece, heralds just such a radical possibility. It should be noted that Voxel8’s printer can’t print every component yet. But that doesn’t lessen its significance. How does it work? In one sense, just like your standard 3D printer, the device is guided by digital modeling software to build shapes out of consecutive layers of plastic. When instructed, the printer pauses and a second print nozzle lays down highly conductive circuits while the operator pops in key components like processor, battery, and motors. 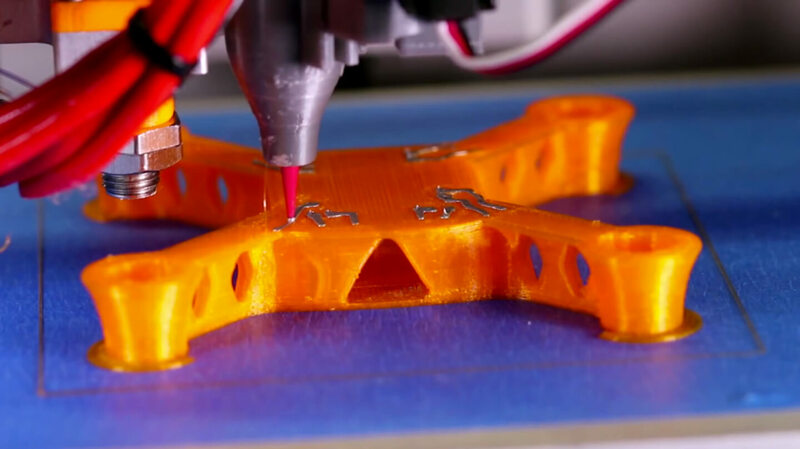 Voxel8’s demo video shows the device printing a working drone quadcopter start to finish. Now, clearly, the Voxel8 printer can’t print a drone from the ground up, never mind a smartphone. But circuitry is the connective tissue of a device, and the printer can make antennas, electromagnetic coils, or stacked integrated circuits. And for more complete 3D printed electronic devices? Think of this as a proof of concept. 3D printed electronics: Some assembly still required. The Harvard research group behind the device has spent years neck deep in materials science. The conductive “ink” that forms their 3D printed circuits reportedly leaves competitors in the dust in terms of sheer conductivity. And in the future, Voxel8 says they plan to develop new “inks” for resistors, sensors, and batteries. As the technology progresses, and the number of printable electronic components grows, it’ll advance 3D printing beyond today’s prototypes and plastic trinkets to useful tools and devices. But not yet. The last few decades of industrial prototyping on big, expensive 3D printers were a bit like the early days of modern computing—the decades of military and industrial supercomputers that required a room and a PhD to operate, and only did a few things really well. But the last few years have looked more like the 70s and early 80s when hobbyists and hackers gave birth to personal computers. Like early PCs, consumer 3D printers are clunky, slow, and in search of a reason for regular folks to buy them. We can expect them to get faster. And their interfaces will get smoother. But that killer application remains elusive. 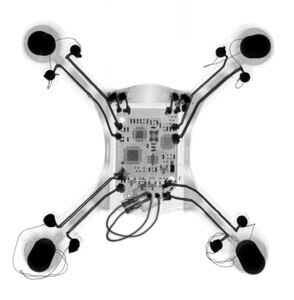 CT scan of a 3D printed quadcopter showing circuit board wired to motors. Expanding the materials 3D printers can use expands what their products can do. That’s why Voxel8 is exciting. Industrial 3D printers can already print with a variety of materials including different plastics and metals. MakerBot recently announced composite wood, stone, and metal filaments for its consumer line of printers at CES. They showed off a hammer that looked and functioned like a traditional hammer (albeit, still not quite as sturdy). Printing tools and replacement parts at home might be an early reason to buy a 3D printer. 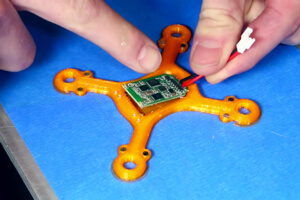 But add a variety of conductive inks and printable electronics to the mix, and we begin to see far more versatile 3D printed objects requiring little to no assembly. Maybe we’ll go to the local print shop for our devices. Maybe we’ll print some of them on our desk. In either case, it’ll be one disruptive technology disrupting another. Why, for example, would Foxconn need to replace humans assembling iPhones with industrial robots, if the manufacturing and assembly process was radically simplified by advanced 3D printers? Or, eventually, perhaps we won’t need a big, centralized manufacturing hub like Foxconn at all. When I learned about Voxel8, I was reminded of William Gibson’s latest novel, The Peripheral, which takes place in both a near and far future. In the near future—virtually everything is 3D printed. Even the protagonist Flynne Fisher’s phone. Perhaps Voxel8’s electronics printing machine marks the beginning of all that. We’re here to find out.